Thrombolytic therapy is the specific therapy for Ischemic stroke , when administered in less than 3 hours ( Now 6 h ?) and has proven to save lives and brain .The only issue is , we need a 100% exclusion of hemorrhagic stroke by a CT/MRI. The mechanism of action of thrombolytic agent is simple .It lyses cerebral thrombosis and makes way for sustained reperfusion and arrest or even reverse the ischemic damage to neurones . And now , let us see , how we perceive the same therapy in a patient with a history of recent ischemic stroke with an acute STEMI . The issue is two fold. He needs urgent myocardial salvage in the form of thrombolysis or PCI . 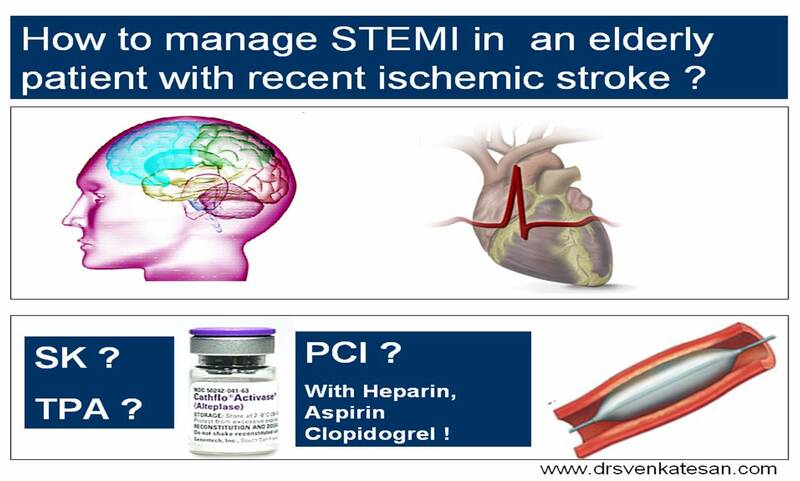 The thrombolysis or PCI should not worsen the cerebral infarct. The term absolute means ‘it is medical crime” to give TPA or Streptokinase. How is it possible when the same drug is projected a savior in acute ischemic neurological emergencies and be dangerous when administered few months later in an evolved ischemic stroke ? The major reasoning against thrombolysis in recent stroke is the potential concern for converting an indolent ischemic infarct into hemorrhagic infarct in a patient who may start bleeding into brain. This is highly conjectural , as a previous history of ischemic stroke in no way increases the bleeding risk .Conversion of ischemic to hemorrhagic infarct tend to occur in the very early hours of acute stroke (not weeks later) .This could be part of calcium induced reperfusion injury . The issue become further complicated with our skewed thinking pattern. If thrombolysis is contraindicated in STEMI , does it any way imply a automatic indication for primary PCI ? It seems so , for most of us ! How safe is PCI in a patient with a previous history of ischemic stroke ? An emergency PCI in a patient who is expected to have widespread cerebral carotid , and peripheral vascular disease is fraught with added hazard. Aortic arch manipulation and aortic valve atherosclerotic changes might increase a risk of another stroke. The drug we administer during PCI are not innocuous ones . Aspirin , Heparin, clopidogrel (sometimes even 2b 3a!) will keep the risk of converting the ischemic infarct into hemorrhagic infarct remain at dangerous levels . This ridicules the very logic of PCI being preferred over thrombolysis in such situations . So it is not an easy decision to do primary PCI in an elderly patient with STEMI and a recent CVA. It is only a mirage of medical intellectualism and the blind following of unscrutinized scientific literature that determine many of the decision making in cardiology . As far as I have searched the superiority or inferiority of thrombolysis vs PCI in recent ischemic CVA has never been compared one to one. The fact may be , such a study is never possible in the future .But it seems PCI has won the trial without a trial . How many deaths have happened due to worsening of stroke after thrombolysis ? How safe is a combination of aspirin, heparin and clopidogrel in a patient with recent stroke ? It may be prudent to redefine the indication for thrombolysis and PCI in a patient with history of recent or remote stroke. It is logical to assess the potential risk of converting the ischemic cerebral infarct into hemorrhagic infarct. All small healed cerebral infarct need not be worried about reactivation. How to asses the healing of cerebral infarct? How good is MRI to predict a healed infarct from nonhealed infarct ? As of now, we have no good tools to identify the safe infarcts that can withstand intensive anticoagulation or even thrombolysis .If the imaging techniques improve we may able to predict complete gliosis and the vascularisation of cerebral scars. How to manage an elderly man with STEMI in a patient with recent ischemic stroke ? Answer : Any of the above can be correct answer . If we still think the answer is only “A” great reforms need to be done in medical science . 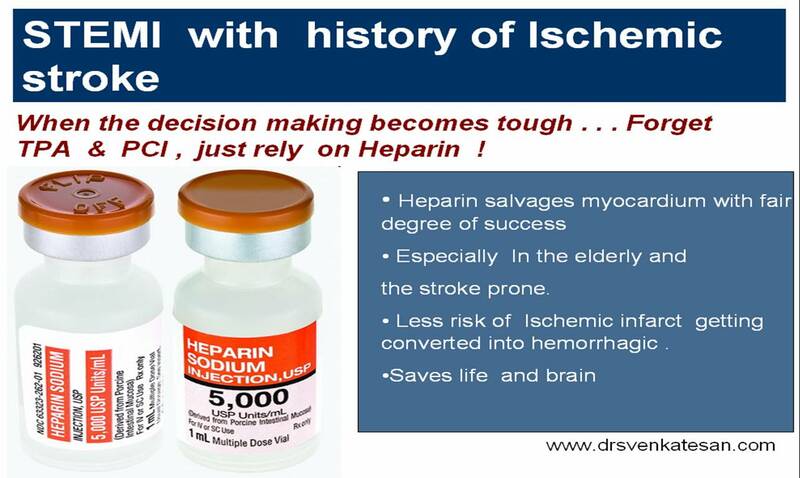 . .
An important option is , neither thrombolysis nor PCI just simple heparin for STEMI in these high risk individuals .This simple treatment has saved many lives . In this world of gross approximation and perceived fears , it may be reasonable to shift the indication of thrombolysis for STEMI( with h/o recent stroke ) from absolute to relative contraindication. Many of the junior physicians in the learning curve may take it as granted in the management of STEMI “If thrombolysis is contraindicated , then primary PCI must be indicated ” This again is absolutely not true !